Does your kitchen need remodeling? Are your kitchen cabinets old and outdated? Do you have a dream kitchen in mind but don't know where to start? Are you looking for a quick facelift for your existing kitchen? 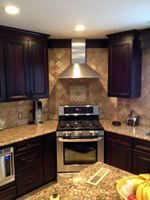 Della Calce Contracting can help you reach your kitchen remodeling goals that fit your budget. Are you not sure what you want? We can give you kitchen ideas to eliminate worries about your kitchen design. Choose from cost effective cabinent refacing to custom new cabinetry. 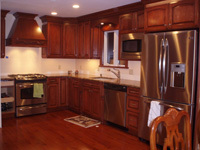 We offer a large selection of kitchen cabinets including wood cabinets and lamininate cabinents. The cabinets are a start but what really tops off a kitchen remodel is quality countertops. You can choose from Corian or Granite or a variety of quartz surfaces.